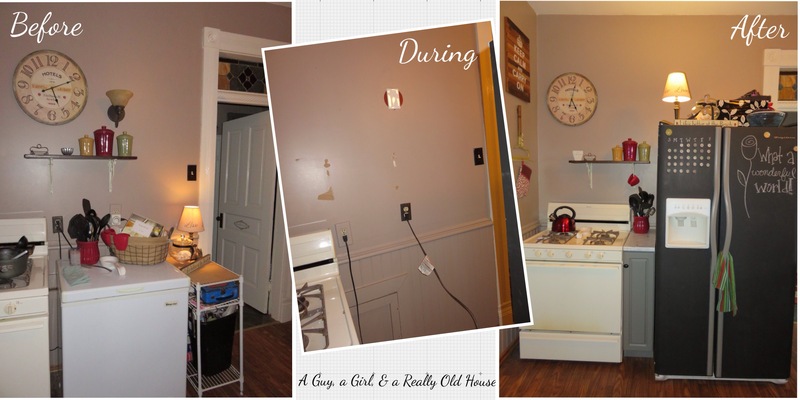 Kitchen Corner | A Guy, A Girl, and a Really Old House! I’ve posted about our kitchen a couple times before. Very shortly after moving in we updated the room with paint. That’s one of my favorite “before and after” pics. What a difference some paint and wallaper (or lack thereof) made! Not long after that I added some decor to warm up the space, but I knew the room would be a work-in-progress for quite some time until we could save enough for a full scale remodel. For that matter, who puts the fridge in front of the only light switch for the room? 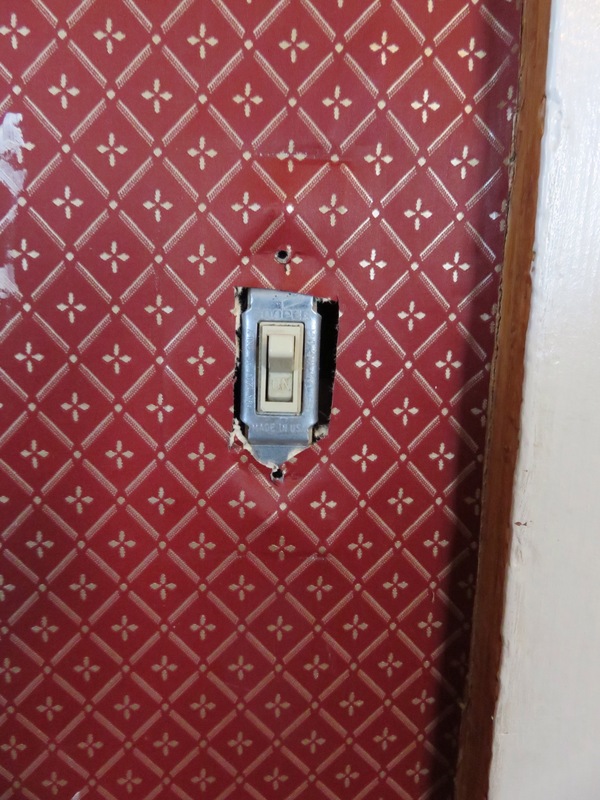 Apparently the same person who trimmed the wallpaper this way. 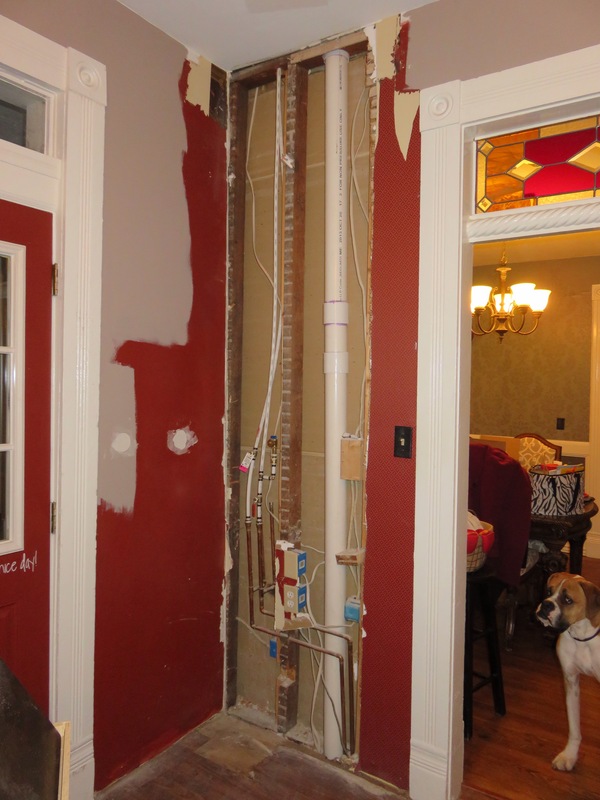 I get that the behind-the-door spot was the only place with existing water access, (We’re pretty sure that’s where the washer/dryer was at one point, because both hot and cold water were run to that corner.) but really? I loathed having our fridge in that location and having to squeeze my hand into the dark unknown just to turn the light on and off. With Tony’s grad school classes starting soon, I was beginning to think this project would never happen, but for Christmas Tony moved the fridge! Best Christmas present ever! Okay, tied with the pneumatic staple gun and the Silhouette Cameo… Tony’s actually very good with gifts! Therefore moving the fridge meant 1) installing a new water line to operate the freezer’s ice maker, and 2) installing sheetrock! I did have a plan, though, to minimize the work factor of the rock. My long-range goal for that corner of the kitchen has always been a little mudroom nook. It’s the main door we use for exit and entry, and it just makes sense that coats, boots, gloves, etc. would be dropped there instead of in the front hallway. Eventually there will be a bench in the corner to hold that stuff too, but for now the deep freeze hides the fact that the flooring doesn’t quite reach the corner – Oh, the joys of old houses. When we got back from our trip I caulked, primed, painted, and installed the hooks. 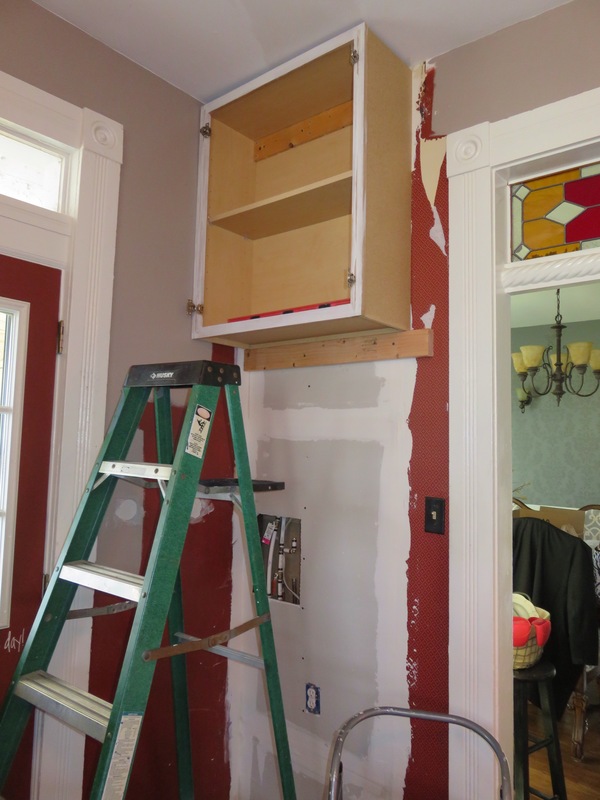 The cabinet wasn’t quite wide enough to fill the whole corner, and there was that bit of wallpaper and border I never took down, (because it was behind the fridge, afterall) so Tony added a little shelf on the side to fill in the rest of the space. When it’s finished, I think it will be a great spot for storing cookbooks. Not only did we gain an entire cabinet to hide away the kitchen gadgets we rarely use, like the electric knife and the soda maker (I won that on the radio! 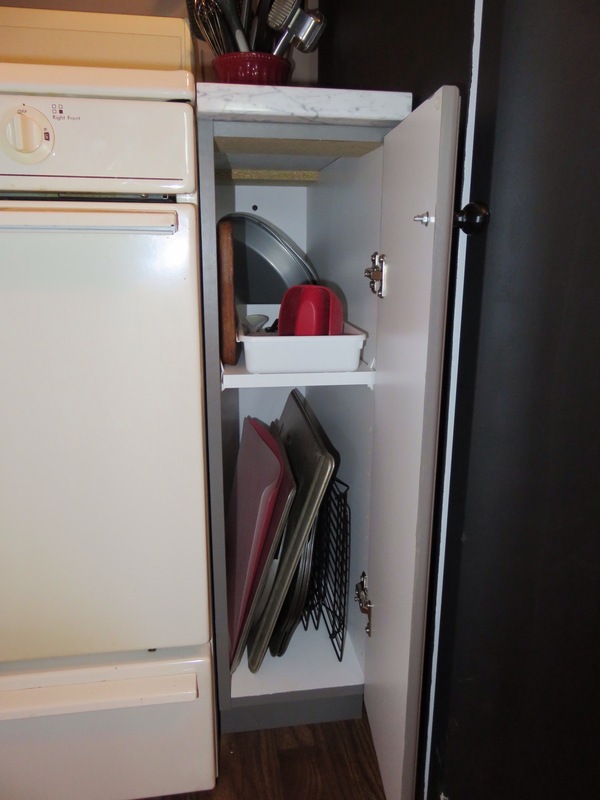 ), but we had enough space between the stove and the fridge’s new spot for a teeny 9 inch wide base cabinet. It’s the perfect spot to set cooking utensils while using the stove and it holds all our baking sheets and stoneware pans – those oddly shaped pans that do better in tall skinny places. We ordered the cabinet from The Depot and put it together ourselves. 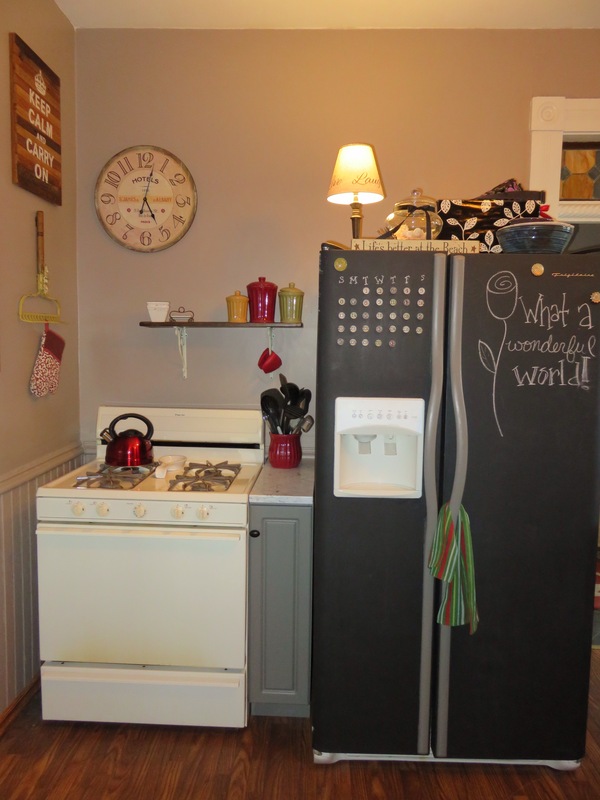 Then I added about 6 thin coats of paint so it would match the existing gray cabinets. The top is a marble remnant from a local shop, now by far the nicest countertop in the whole house! The setup’s not perfect, but no layout is really perfect in a room that must balance three doorways on three different walls, windows and built-in shelving on the other one, and retrofitted gas and water lines that come through the floor and not the wall. 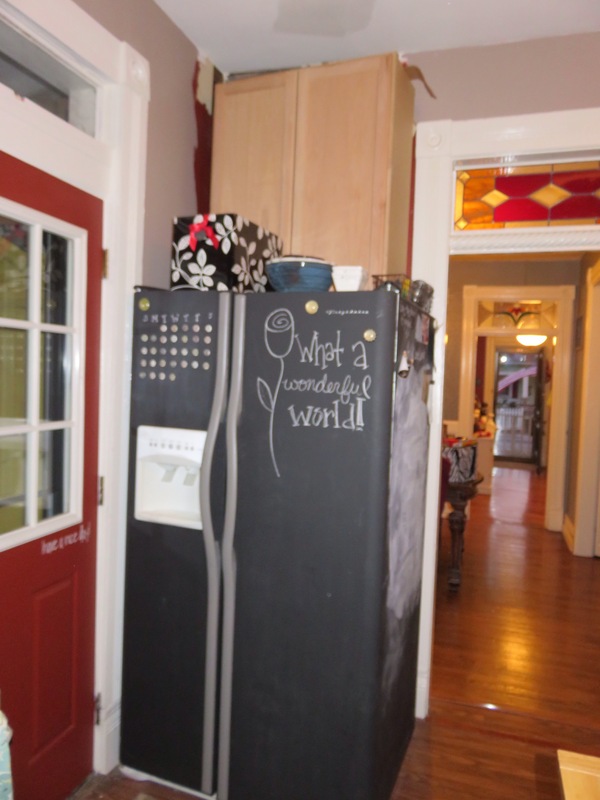 The fridge is much deeper than the deep freeze was, and it does make the space near the island a little tight, but I feel it’s worth it to be able to open the back door all the way! I’m loving that there’s a spot to put my coat and purse right when I walk in, and I’m particularly excited about the extra space those two little cabinets created. I absolutely love our open shelving, but there are so many kitchen things that just need to be hidden away. That little doorway behind the basket leads to the water shut-off valve for the bathroom upstairs. 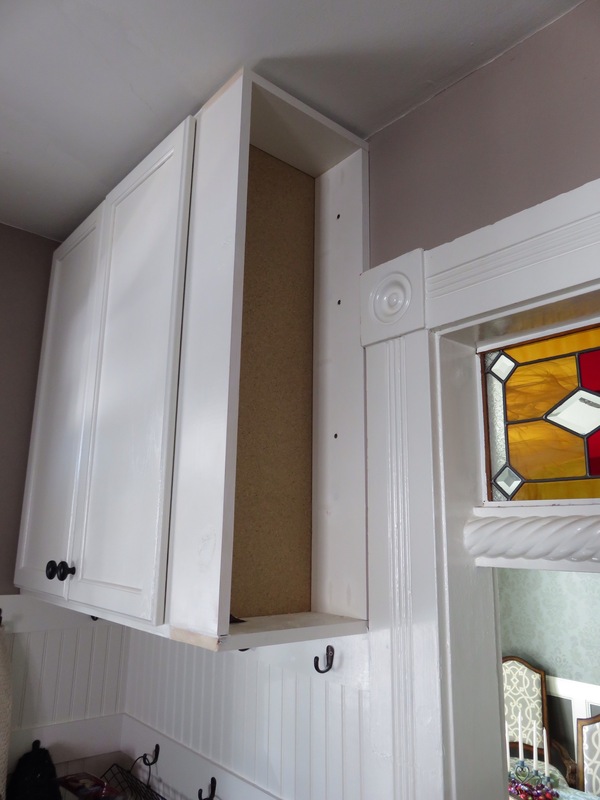 We wanted to keep that accessible in case of emergency, so Tony cut out a square of the beadboard and we used a cabinet lock to keep it closed. I’m actually thinking that these tweaks will render a full remodel unnecessary. But don’t worry. I’m still not quite done with the kitchen! Shall we see the before and afters again? 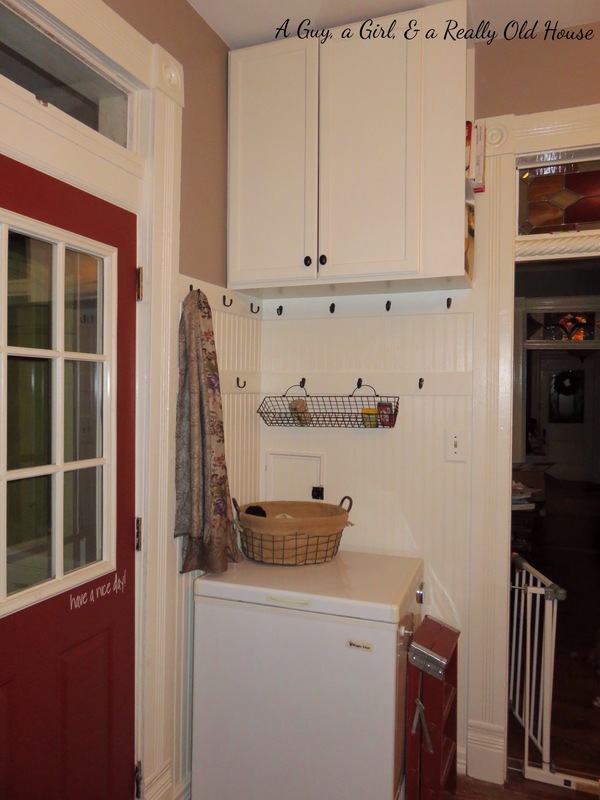 I’m realizing the photo above makes it look like the fridge is in front of the door trim on the right, but it’s not! It does cover the light switch, but that’s the switch for the cellar light, and we almost never go down there anyway! 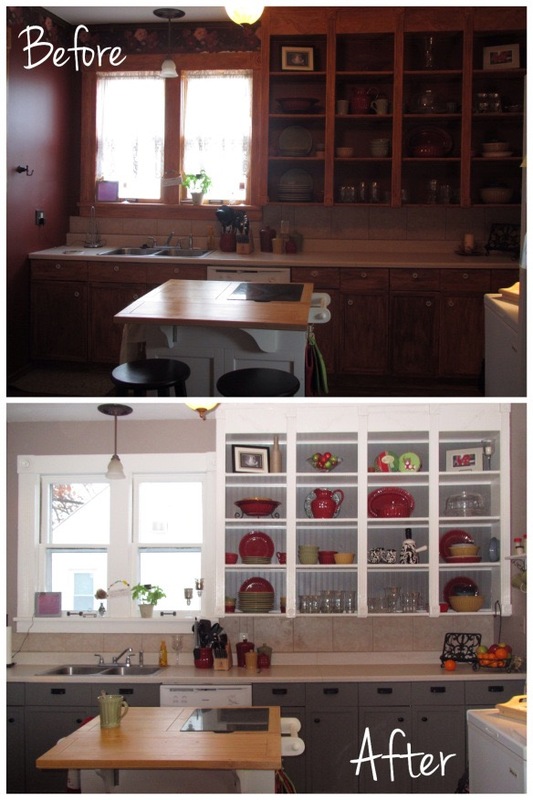 This entry was posted in Cabinets, Decor, Kitchen and tagged Kitchen, Paint. Bookmark the permalink. Great job Lindy and Tony. Always fun to see what your next project will be. 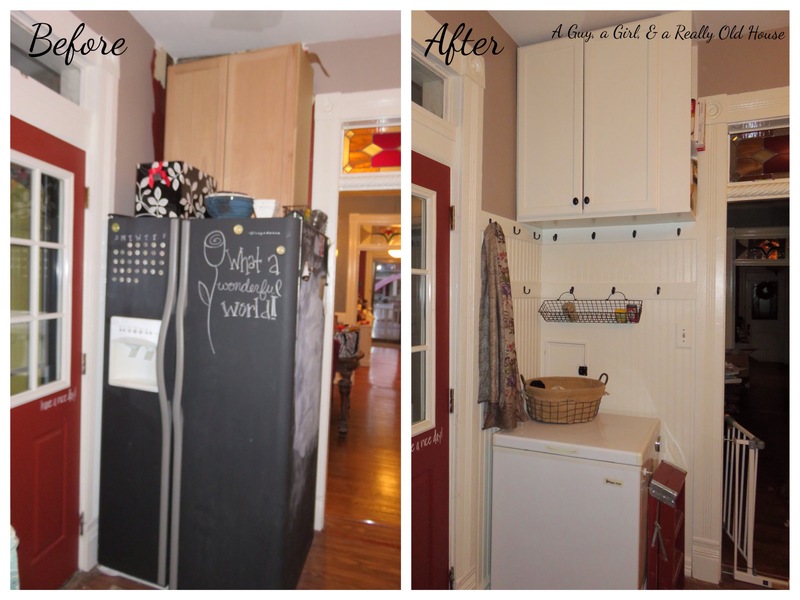 Pingback: Shelves that Slide – Another Kitchen Project | A Guy, A Girl, and a Really Old House! Hi – Just found your blog while looking for breadboard inspiration! Love all of your amazing kitchen changes – I think it would look great if you put beadboard or beadboard wall paper over your backsplash tile on the wall by the sink and under that major open cabinet…. Thanks! Yes, that’s something I’d really like to do. I just need to work up the nerve to see what’s behind that tile!